Robocop – released 30 years ago today – is perhaps one of the finest examples of mainstream sci-fi action to ever hit our screens. The power and energy of that original violent epic from 1987 may have suffered a couple of chinks in its armour from a couple of diminishing returns sequels, a bland TV show and even an animated series. But you’ll have to seriously think it over creep if you think Robocop still doesn’t stand tall, in that rather cool pose with that automatic weapon coming out of his leg. Take that TJ Laser! Infact Robocop is the greatest comic book adaptation that was never a comic book in the first place, with its humour, visuals and over the top violence you’d certainly be forgiven for thinking that it was and was certainly no surprise when he made the transition to comic books and graphic novels, even sharing panel space with that other 80s cyborg, The Terminator and even Predator and Alien. Fine and deserving company. What has made Robocop stand the test of time and head and robotic shoulders above the competition is that not only is it an exceptionally well made film, Dutch Director Paul Verhoeven’s US debut, that neatly weaves action, violence and pokes fun at Americana in a way European filmmakers do with such aplomb but also its actors. 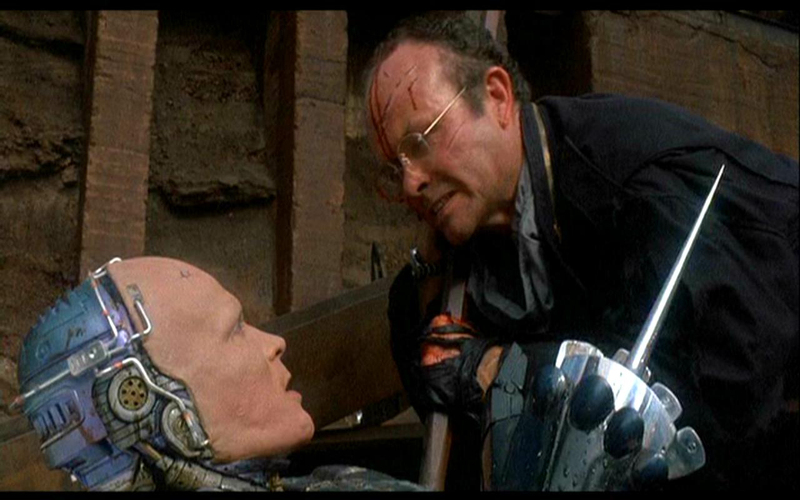 You believe the actors, Robocop would not have worked with an established actor’s chin in the role (see Stallone’s Judge Dredd for details) and you really buy into Peter Weller’s portrayal of Murphy and later Robo when he starts getting some of his human memory back. In fact despite its futuristic dystopian setting it is very much Frankenstein meets Jesus in many ways. Fact is that Weller is as synonymous with Robocop as Boris Karloff was with Frankenstein and it just doesn’t work as well with someone else in the role, which considering how much you see of him is odd. Weller will forever be Murphy and Murphy will forever by Robocop. Back to that Jesus comment, Director Verhoeven is cited as saying that the film is a Christ story, witness how Murphy is laid out with him arms, Christ on the cross like before he is crucified by Boddiker and his cronies, in what is one of the most shocking scenes of the film, especially with those added faux tracking noises that just ramps up the tension and unease. Of course latterly as part man and part machine, with some human memories remaining, those scenes are truly exquisite and you really feel the characters pain, you see Murphy get resurrected. He may not feed people with an abundance of loaves and fishes, clearly that scene ended up on the cutting room floor, but we do see Robo walk on water at the steel factory before the end of the film. It’s a take on the film that I’m not entirely sold on but certainly helps it transcends its mere action sci-fi trappings. Kurtwood Smith is electric as Clarence Boddiker, so much so I find it difficult to watch him in his sitcom guise in That 70’s Show, it just doesn’t seem right. Miguel Ferrer, in a short but pivotal role, and the epitome of corporate evil, Ronny Cox are also delights in this very 80s film that perhaps says more about greed being good and corporate America than Wall Street ever did. Infact with its criticism’s of a money driven media obsessed society you could even argue that is more relevant today than it ever was, with the passage of time making it more science faction of sorts. It was rather telling then that disgraced former President, Richard Nixon, was hired to promote the home video release. Genius. Basic Instinct and Starship Troopers certainly had their moments of flair but it’s a crying shame that Verhoeven hasn’t shown the zeal that punctuates almost every moment of this thinking man’s action classic. 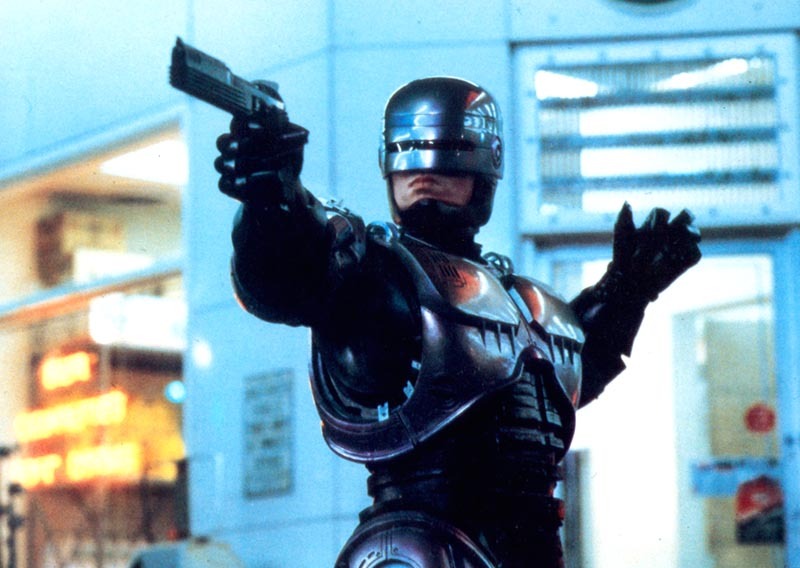 If you’ve seen Robocop but not seen it in a while then your prime directive this is to get to know him again, if you’ve never seen it, then shame on you. Some of the effects may not have aged too well, remember it was 1987, but ED 209 still has a Harryhausen-esque charm about him and at the end of the day the story is king and so is Robocop.